The proposed etiology of this laxity was related to the method used by gamekeepers to kill wounded rabbits. A gamekeeper would hold the rabbit's legs in one hand and wedge the animal's neck in the cleft between the thumb and index finger of the other hand. By forcefully pulling on the rabbit's legs, the neck was stretched and extended against the ulnar side of the thumb, thus breaking the neck and killing the rabbit. The multiple repetition of this maneuver was thought to be the cause of the UCL laxity found in 20 of the 24 Scottish gamekeepers examined in Campbell's study. More than a decade earlier, acute rupture of the UCL of the thumb as a result of major trauma was reported in Europe. European authors made the correlation between downhill skiing and this injury, coining the term skier's thumb. The proposed mechanism of injury was a traumatic avulsion of the UCL from forced abduction of the thumb proximal phalanx. This forced abduction occurred from falling on the outstretched hand while still holding a ski pole. Any extreme valgus stress on the thumb can result in a ligamentous disruption of the UCL. The most common mechanism is a fall on the abducted thumb. Stener observed and reported several cases in which a distal rupture of the UCL of the thumb MCP joint occurred, with interposition of the adductor aponeurosis between the distal site of attachment of the ruptured ligament and the detached ligament. 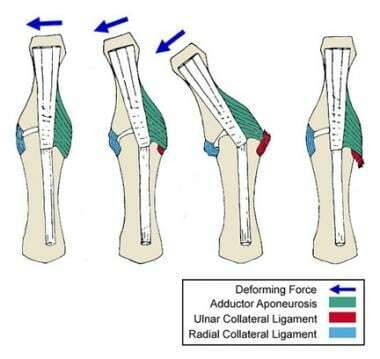 The interposed adductor aponeurosis maintains separation between the ruptured ends of the ligament and thus prevents ligamentous healing and restoration of joint stability. Little controversy exists regarding the need for operative intervention for a true Stener lesion. As with any surgical procedure, however, surgeon-dependent variations exist with respect to operative technique and postoperative protocol. The clearest and most eloquent anatomic depiction of the Stener lesion can be found in Stener's 1962 article. Most of the material included here is adapted from his original work. Important structures around the MCP joint include the adductor aponeurosis and tendon, the dorsal aponeurosis, the collateral ligament proper, and the accessory collateral ligament of the thumb. The adductor aponeurosis serves as an active restraint to thumb abduction but has no passive role in MCP stability. Severance of the adductor aponeurosis has no effect on lateral stability. The UCL of the thumb is composed of two discernible components, the accessory and the proper. In his cadaveric dissections, Stener found that the UCL proper was taut in flexion and loose in extension, whereas the opposite was true for the accessory UCL. Transection of the UCL proper resulted in increased abduction when the MCP joint was flexed but not when the joint was held in the extended position. This instability was found to be slight and did not become severe until the accessory UCL was severed as well. The volar plate restricted abduction when the MCP joint was extended, even when both the UCL proper and the UCL accessory were severed. The UCL provides lateral support and prevents volar subluxation of the MCP joint. Stability of the thumb MCP joint to abduction is vital for key pinch, tip pinch, and thumb opposition. Stener described a lesion produced by forced thumb abduction in which the distal attachment of the UCL was traumatically avulsed from the proximal phalanx of the thumb. The severed end would become caught under the adductor aponeurosis and therefore be unable to return to its anatomic position. Consequently, the severed ligament would fold on itself and thus be prevented from healing and restoring stability to the MCP joint (see the image below). Displacement of the ulnar collateral ligament by the adductor aponeurosis during hyperabduction of the thumb. With a Stener lesion, a situation exists in which the MCP joint of the thumb is rendered permanently unstable because the UCL is prevented from healing by the interposed adductor aponeurosis. The resultant chronic instability significantly impairs function in the injured hand. Stener's original article was a significant contribution to the treatment of acute disruptions of the UCL of the thumb MCP joint. If a Stener lesion is recognized early, the UCL may be reduced operatively and secured in its anatomic position. Early recognition and anatomic reduction can result in excellent functional outcome in the vast majority of cases. Late presentation or a delayed diagnosis of a Stener lesion may produce a need for more involved surgery, with less desirable results. Stener B. Displacement of the ruptured ulnar collateral ligament of the metacarpophalangeal joint. J Bone Joint Surg Am. 1962 Nov. 44B(4):869-79. Campbell CS. Gamekeeper's thumb. J Bone Joint Surg Br. 1955 Feb. 37-B(1):148-9. [Medline]. Heyman P, Gelberman RH, Duncan K, Hipp JA. Injuries of the ulnar collateral ligament of the thumb metacarpophalangeal joint. Biomechanical and prospective clinical studies on the usefulness of valgus stress testing. Clin Orthop Relat Res. 1993 Jul. 165-71. [Medline]. Louis DS, Huebner JJ, Hankin FM. Rupture and displacement of the ulnar collateral ligament of the metacarpophalangeal joint of the thumb. Preoperative diagnosis. J Bone Joint Surg Am. 1986 Dec. 68(9):1320-6. [Medline]. Glickel SZ, Malerich M, Pearce SM, et al. Ligament replacement for chronic instability of the ulnar collateral ligament of the metacarpophalangeal joint of the thumb. J Hand Surg [Am]. 1993 Sep. 18(5):930-41. [Medline]. Lohman M, Vasenius J, Kivisaari A, Kivisaari L. MR imaging in chronic rupture of the ulnar collateral ligament of the thumb. Acta Radiol. 2001 Jan. 42 (1):10-4. [Medline]. Shinohara T, Horii E, Majima M, Nakao E, Suzuki M, Nakamura R, et al. Sonographic diagnosis of acute injuries of the ulnar collateral ligament of the metacarpophalangeal joint of the thumb. J Clin Ultrasound. 2007 Feb. 35(2):73-7. [Medline]. Gherissi A, Moussaoui A, Liverneaux P. [Is the diagnosis of Stener's lesion echograph-dependent? A series of 25 gamekeeper's thumb]. Chir Main. 2008 Oct. 27 (5):216-21. [Medline]. Rochet S, Gallinet D, Garbuio P, Tropet Y, Obert L. [Rupture of the thumb ulnar collateral ligament of the metacarpophalangeal joint: is it possible to operate according to the position of sesamoides on dynamic Xray]. Chir Main. 2007 Aug-Oct. 26(4-5):200-5. [Medline]. Ebrahim FS, De Maeseneer M, Jager T, Marcelis S, Jamadar DA, Jacobson JA. US diagnosis of UCL tears of the thumb and Stener lesions: technique, pattern-based approach, and differential diagnosis. Radiographics. 2006 Jul-Aug. 26 (4):1007-20. [Medline]. Lark ME, Maroukis BL, Chung KC. The Stener Lesion: Historical Perspective and Evolution of Diagnostic Criteria. Hand (N Y). 2017 May. 12 (3):283-289. [Medline]. Tresley J, Singer AD, Ouellette EA, Blaichman J, Clifford PD. Multimodality Approach to a Stener Lesion: Radiographic, Ultrasound, Magnetic Resonance Imaging, and Surgical Correlation. Am J Orthop (Belle Mead NJ). 2017 May/Jun. 46 (3):E195-E199. [Medline]. [Full Text]. Melville D, Jacobson JA, Haase S, Brandon C, Brigido MK, Fessell D. Ultrasound of displaced ulnar collateral ligament tears of the thumb: the Stener lesion revisited. Skeletal Radiol. 2013 May. 42 (5):667-73. [Medline]. Milner CS, Manon-Matos Y, Thirkannad SM. Gamekeeper's thumb--a treatment-oriented magnetic resonance imaging classification. J Hand Surg Am. 2015 Jan. 40 (1):90-5. [Medline]. Kozin SH, Bishop AT. Gamekeeper's thumb. Early diagnosis and treatment. Orthop Rev. 1994 Oct. 23(10):797-804. [Medline]. Neviaser RJ, Wilson JN, Lievano A. Rupture of the ulnar collateral ligament of the thumb (gamekeeper's thumb). Correction by dynamic repair. J Bone Joint Surg Am. 1971 Oct. 53(7):1357-64. [Medline]. Puhaindran ME, Cheah AE, Yong FC. Re: "Stener lesion" after collateral ligament rupture of the proximal interphalangeal joint of the index finger. J Hand Surg Eur Vol. 2008 Oct. 33(5):678-9. [Medline]. Stress view of ulnar collateral ligament. Completed repair using suture anchors for fixation.